Set the stage with charming, historically accurate pedestal barstools. 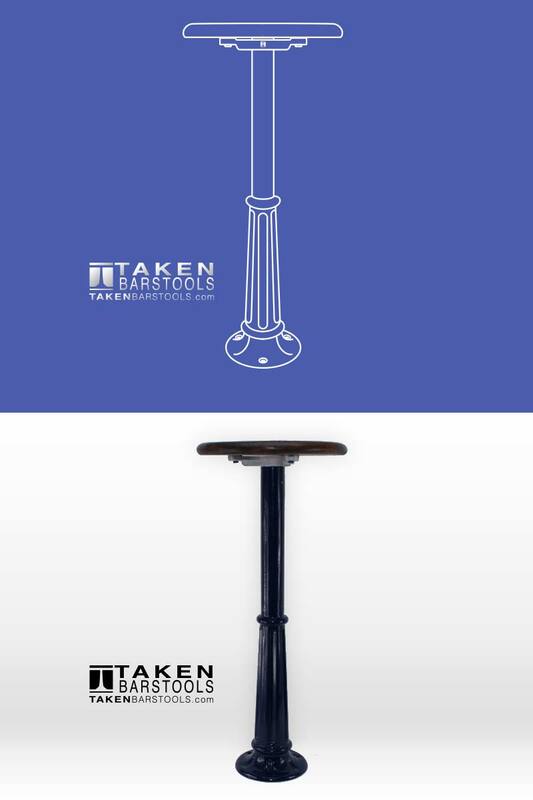 Hand cast aluminum pedestal barstools are the perfect addition to your classic decor. Need to match a specific color? Just ask Luke. Approximately 3-5 weeks. Rush orders not available. Engineered for precision, durability, and reliability. Guaranteed. Many of your questions can be found here. If you can't find your answer here, contact Luke. How many color choices do I have? Henry Ford once said, "You can get it in any color you want as long as it's black." We're not short-sighted like Mr Ford because we want the color you want. We will do our best to closely match your designer's project mood board or your preferred Pantone code. Of course, we also have classic black. BTW, Henry painted his Model T black for a reason - it dried the fastest. How long does it take to make a barstool? Like quality beer, it generally take 3-5 weeks. The time it takes for your barstool to go from raw materials to finished and ready to install depends on a number of different factors. We start with ordering the powder coating because that takes at least 2 weeks. Meanwhile, back at the shop we begin with raw casting with an alloy, drill and tap. We ship these to our powder coating shop to meet the arrival of your special order color. We return to the shop to cut the seats, assign the holes to drill and insert, then we stain and finish with waterbase varnish. We use eco-friendly stains and finishes because we don't want ot kill our employees (read: me). What styles do you have? How do you ship your barstools? We wrap each barstool individually. We can ship up to 36 barstools in a crate that fits onto a pallet. Currently, our two preferred shipping companies are Yellow Freight (YRC) and UPS. Are the barstools weather worthy? The barstool pedestals are weather worthy, the seats are not. Contact Luke if you want to install your barstools outside at the mercy of Mother Nature. 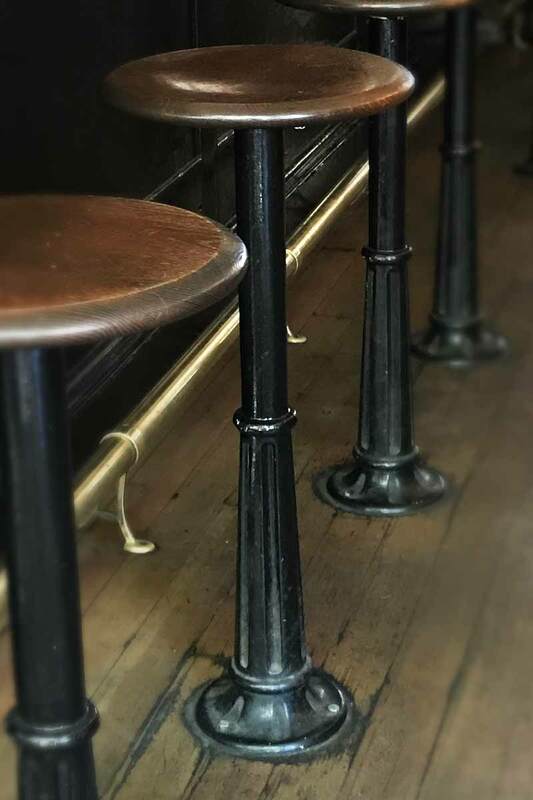 How heavy are the barstools? They're so heavy that if you ever decide to leave the restaurant business, you could prop your Volkswagon Bus up on one to change the oil. Our serious answer is 10 lbs. Why do I need to worry about a loading dock? Shipping companies want the ability to back their trucks up to the building that lines up with the bed of their trucks. If they have to use a ladder or incline to get product out of the truck, that adds time. When time is added, so is the cost. What if I don't have a loading dock? If you're in a friendly neighborhood, perhaps a fellow business has one you could use. Just have the driver back up to their loading dock for drop off. Be sure to ask your neighbor first -along with a box of donuts or special beverage as a thank you. Saying please with thank you gifts go a long way to forging friendships. Do you guarantee your barstools? Yes we do. Our barstools are pretty durable. If anything goes wrong, we'll fix it. Just like that. We have both wholesale and retail pricing. You can find them on each product page. Just fill out this short form and I will get back to you within a few hours. Hate forms? Call me or text me at +1 971 251 0439. As we turn a new style, we are saving seats for new partnerships. Would you like us to save you a seat? We will keep your info safe; we don't like spam either.